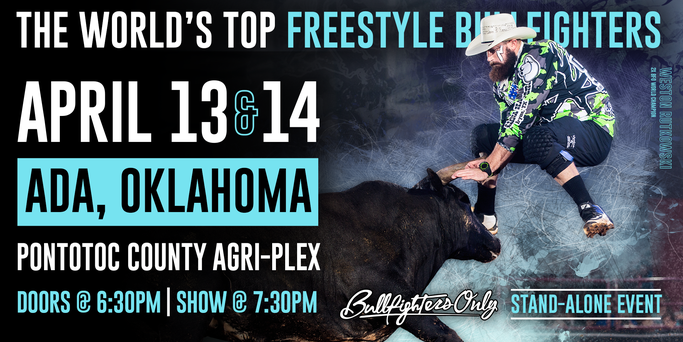 ADA, Okla. – Toby Inman is having the most fun of his career as a freestyle bullfighter and it showed in his demeanor this past Saturday. He earned the Bullfighters Only Ada Invitational championship through two wild bouts on Saturday night and walked away from the Pontotoc County Agri-Plex with $12,000. “I’m flabbergasted,” said Inman, a bullfighting veteran from Davis Junction, Ill. “I’m stoked, and it hasn’t completely set in yet. Inman was the lone veteran to qualify for Saturday night’s Hooey Championship Round. He was joined by rookies Colt Oder, Tucker Lane and Justin Ward, three up-and-coming athletes who made their way to Saturday’s competition through Friday’s Qualifier Rounds. “My first-round bull was just fun,” he said of his 85.5-point fight, the highest marked bout of the weekend. “Bulls like that are the whole reason to do it. When it’s not fun, that’ll be the time I hang up my hat. Even the short-go bull – the one that wanted to eat me – he made it fun because he made me work at it. Inman posted the highest score to walk away with the lion’s share of the purse. A year ago, he finished second in the Pendleton Whisky World Standings with $26,983. Through just six events in 2018, he has earned two victories and $24,500 and leads the world standings by about $15,000. It’s the perfect example of how much money is available in the BFO already. In a surprising turn of events, rookies Colt Oder, Tucker Lane and Justin Ward all qualified for the Championship in Ada. 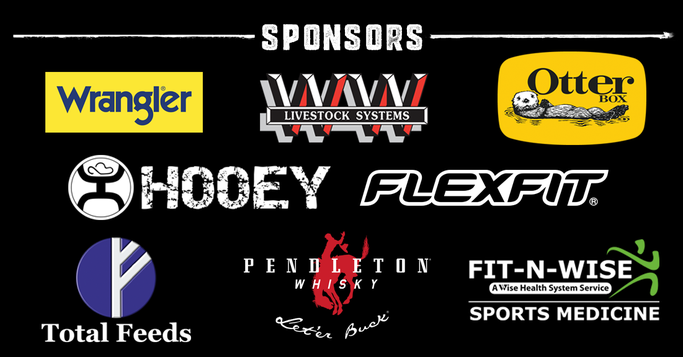 They bested a field that featured champions like the two-time reigning BFO world titlist, Weston Rutkowski, and Dusty Tuckness, who has been recognized for eight straight years as the best bullfighter in ProRodeo. There were also nine other veterans in the mix that didn’t make it to the final round. 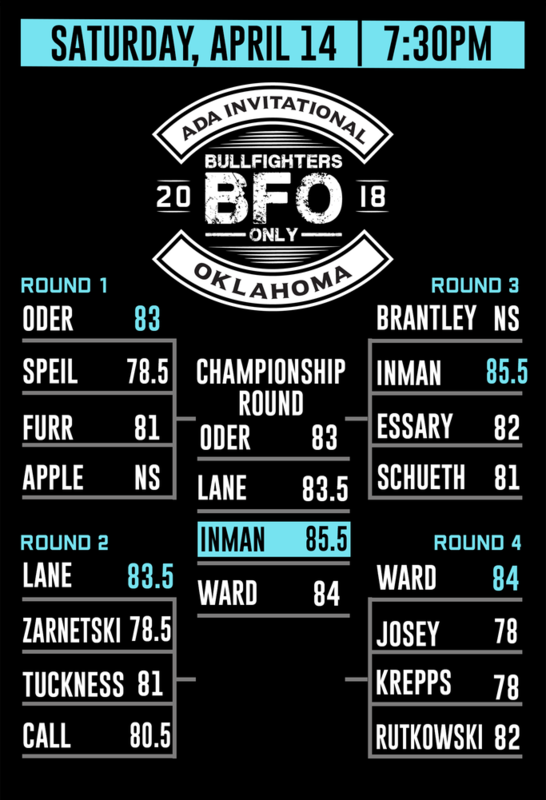 Oder finished second in the championship round, just half a point behind Inman. He proved the quality of education that happens at the BFO Development Camps – he attended the camp last March in San Bernardino, Calif. In fact, he was one of nine young bullfighters at Ada that have been part of the D Camps. “Last year was my rookie year, and I got my start at a D Camp,” he said. “That’s the first place where I stepped around Spanish fighting cattle. I got to go to a few events after that and got to be part of the Super Camp. Even as one of the oldest guys on tour, Inman is seeing just how special those educational opportunities are for the up-and-coming bullfighters. It’s also going to make the bullfight game even better for years to come. “There are just so many more opportunities now than there was when I first started,” Inman said. “I just got paid $12,000 for winning Ada. When I won it last, you might win a couple thousand dollars, but that’s it. Now the money is where we deserve it and, it helps with the name and recognition of what should be coming for a lot of years. Round 1: 1. Colt Oder, 83 points, 2. Kris Furr, 81; 3. Dayton Spiel, 78.5; 4. Schell Apple, 0. Round 2: 1. Tucker Lane, 83.5 points; 2. Dusty Tuckness, 81; 3. Zach Call, 80; 4. Tanner Zarnetski, 78.5. Round 3: 1. Toby Inman, 85.5 points. 2. Jimmy Essary, 82; 3. Beau Scheuth, 81; 4. Tanner Brantley, 0. Championship Round: 1. Toby Inman, 84 points; 2. Colt Oder, 83.5; 3. Tucker Lane, 82.5; 4. Justin Ward, 80.